Keep the pasta. Ditch the starch. Grab your copy of Oodles of Zoodles and learn how to turn zucchini into noodles, and zoodles into your favorite pasta dishes. Wait…what the heck is a Zoodle? 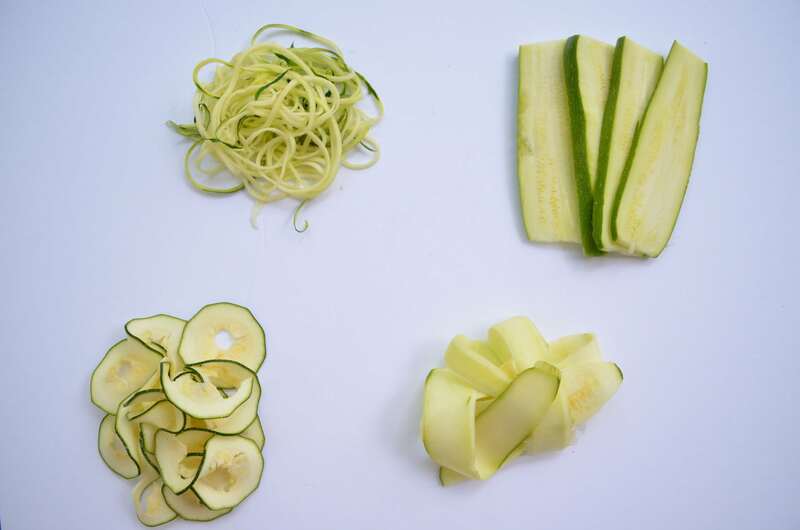 Zoodles are zucchini noodles, or, zucchini cut into the shape of pasta and used as a pasta substitute to make delicious low-carb dishes you crave. 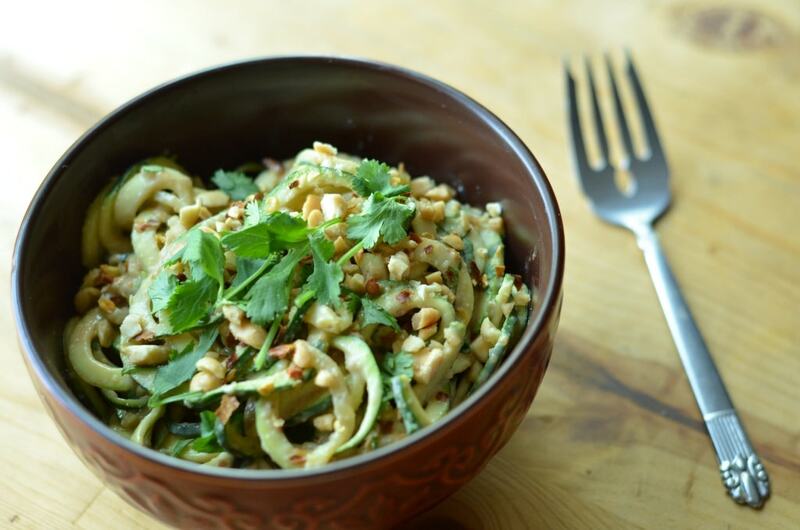 If you’re new to low-carb cooking…or just want some new ideas, Oodles of Zoodles is just what you need! If you’re ready to start making delicious pasta dishes with zoodles, I have several great options for you! Do you love books you can hold in your hands? The Oodles of Zoodles paperback version comes with complete instructions on cutting, prepping and cooking zoodles, along with delicious recipes with beautiful pictures! Don’t wait to get your book! The Oodles of Zoodles eBook is delivered instantly and is a PDF document that displays beautifully on your smartphone, tablet or computer. Wait…who are you? And why are you making Zoodles? If this is your first time to this site, let me first introduce myself. Hi! My name is Nik (short for Nikki and, yes, that is my legal name!). I had RNY gastric bypass surgery in 2008. When I had surgery I had no idea the impact it would have on my life. Yes, I lost 155 lbs., but I also went through a significant period of food mourning! That is…until I realized I could still have every single taste I love. I didn’t have to sacrifice anything. I just needed to learn to play with my food! What does that mean? To me it means finding what I truly love about a food (its flavor, its texture, essential ingredients) and using that knowledge to make any dish I want with healthier ingredients. After you snag your copy of Oodles of Zoodles, I invite you to hit the “Home” button and check it out. There’s a lot to see. Bariatric Foodie prides itself on creative, high-protein, low-carb recipes that leave you feeling as much joy about your eating life as you do about your tremendous weight loss! So you might be wondering…is there really all that much you can do with a zucchini? In short, the answer is YES! The technique used to make a zucchini into a zoodle is commonly called spiralizing (and you commonly use a vegetable spiralizer to do it). You can spiralize a lot of different vegetables such as carrots and potatoes, and even fruit, like apples! Oodles of Zoodles focuses in on zucchini because, believe me, there’s plenty to be done! Check it out. As far as zoodle shapes, there are several. In the book, we mainly work with three kinds of zoodles. These can be made thick for fettucine-like recipes or thin for an angel hair pasta-like experience. Spaghetti zoodles are great for so many classic Italian and Asian pasta dishes. Ribbon Zoodles are so much fun! They can take the place of a few different kinds of pasta such as rotini, as well as egg noodles. In Oodles of Zoodles I use them to make everything from a Cajun Pasta dish to a Weeknight Stroganoff Meatball pasta! Lasagna zoodles are awesome! Not only can you make a kick-a$$ no-noodle lasagna with them, you can also make things like rollatini and other fun dishes. Here’s a sampling of what you’ll see inside the book. No worries, protein lovers. 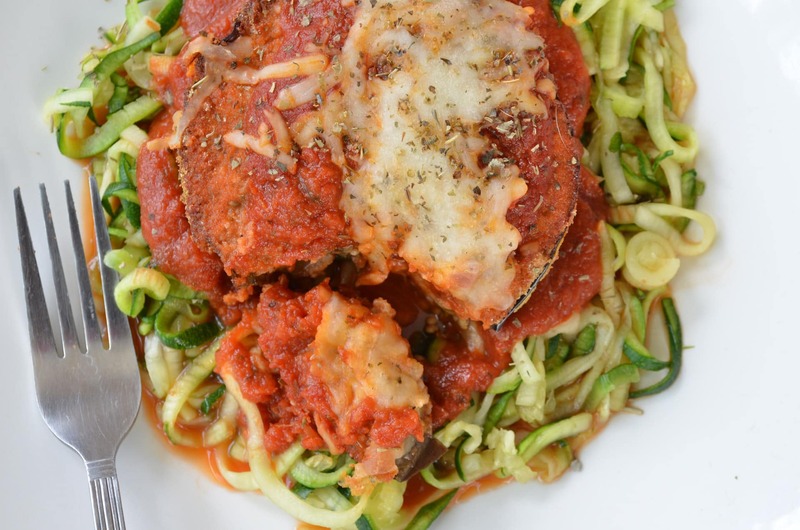 There’s also a recipe for baked Chicken Parmesan with Zoodles! But I love the eggplant. 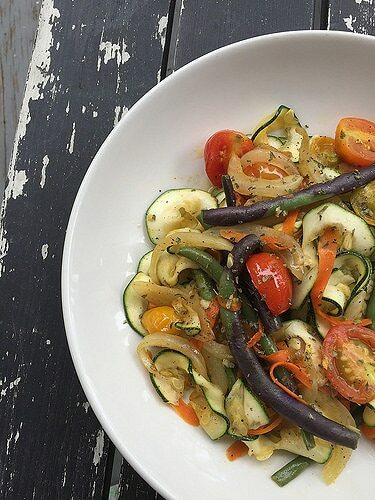 It’s a fresh meal perfect for summer, when zucchini are in full season. 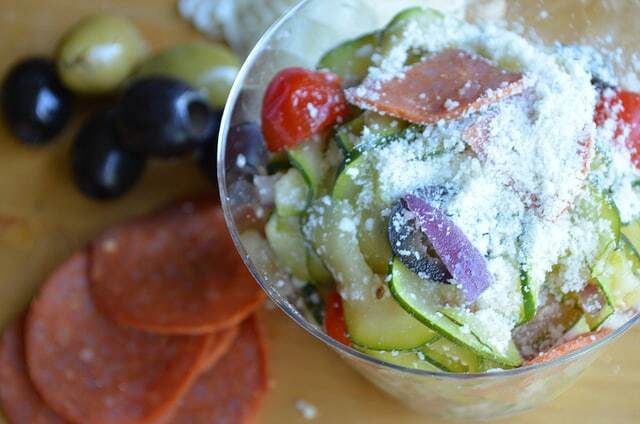 This recipe is not only simple to make, but the eggplant freezes well for make-ahead success! 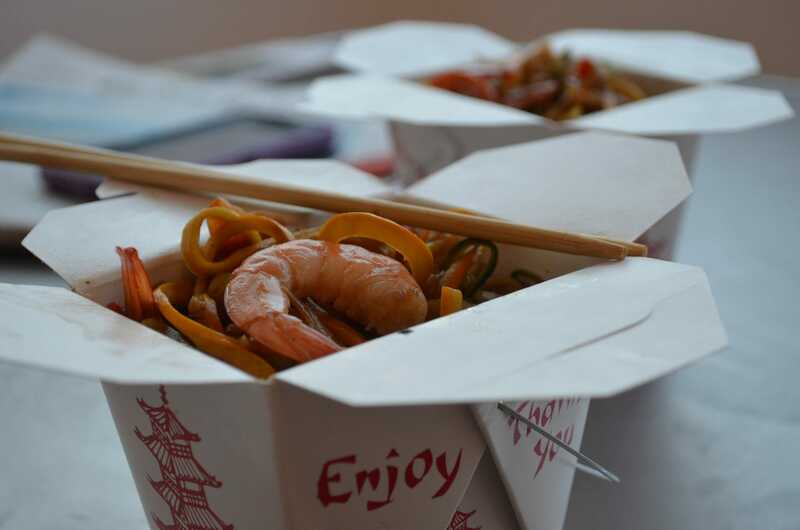 This one is for all my take-out junkies! This recipe is so ridiculously simple to make, I now feel silly actually ordering take-out! It combines a few spices, a yummy sauce, some shrimp (or chicken or even beef, if you like) to make Chinese take-out zoodle magic! For this recipe, we don’t so much focus on specific ingredients as much as we focus on using what’s in season in your local farmers market to make a beautiful, delicious zoodle meal. During the summer, there is an abundance of fresh-vibrant vegetables. Pair them with zoodles for a feast of the eyes and the taste buds! As a bariatric patient nothing irks me more than going to a barbecue or picnic and finding that all the sides are some sort of pasta salad! I can’t tolerate pasta well so it will just never work for me. But now I have a solution. In Oodles of Zoodles I give you a whole section on cold zoodle salads that can replace the carby versions at your next summer gathering! I got you covered! Check out the options once more and let’s get started.